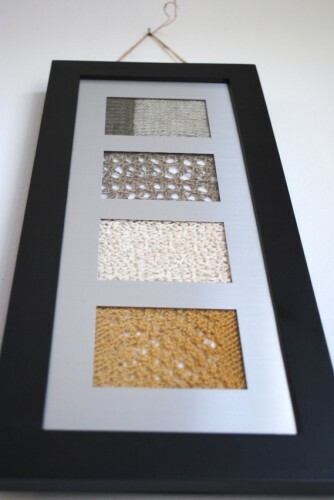 If you love to knit, why not showcase your talents throughout your home? 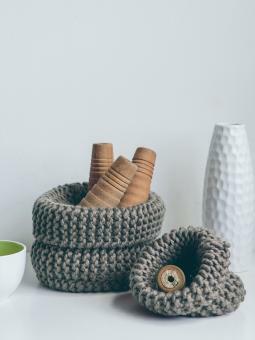 There are an endless number of ways to incorporate your passion for knitting into your home decor, regardless of whether you prefer a traditional or contemporary look. 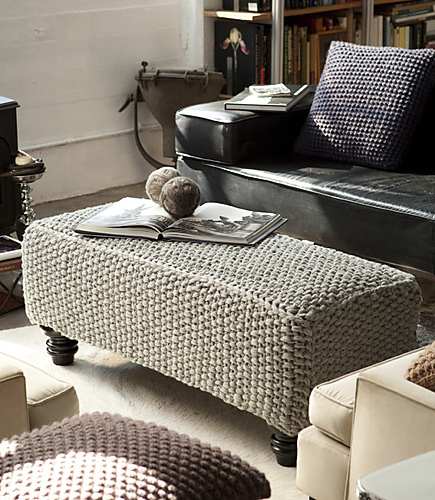 Oversized poufs are a hot home decor trend, serving as coffee tables, foot stools, decor accents, or extra seating. Visit Feel It Cool to see a wide range of ideas for how to incorporate knitted poufs into your home, as well as a link to a video tutorial for this clever DIY project. 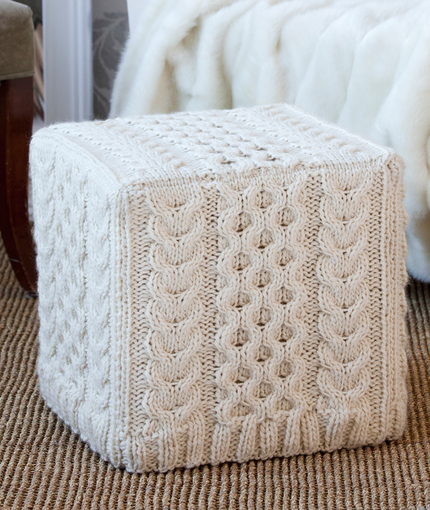 Purchase an inexpensive ottoman cube and update it with a knit cover in a textured cable pattern. Red Heart shows you how. Update furniture that’s seen better days with a knitted cover. 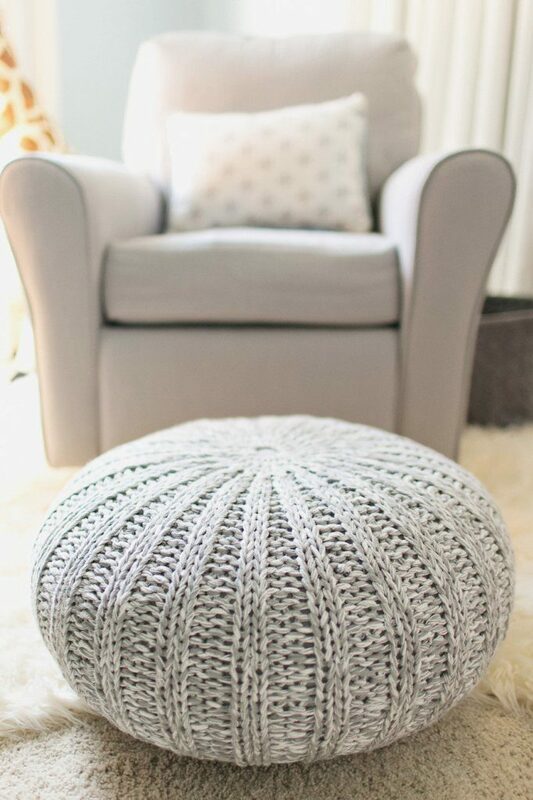 Ravelry has the pattern for purchase, as well as instructions for how to customize the project to fit your ottoman size. 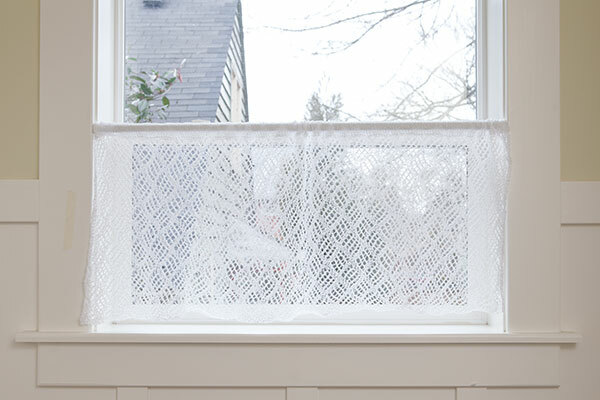 Knit yourself some elegant lace curtains with a free pattern from Knit Picks. This intermediate level project creates curtains that measure 48″ x 15″. 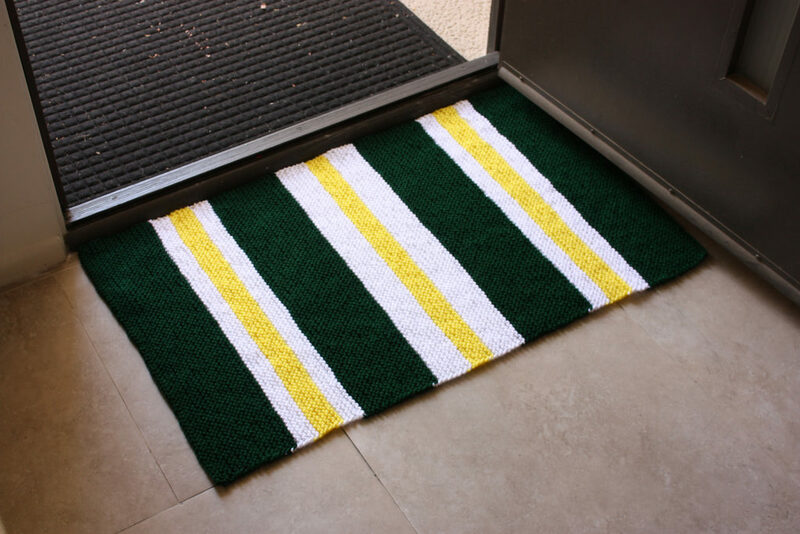 Save money and create a one-of-a-kind item for your home decor with this easy knitted rug pattern from Ravelry. The only stitch you kneed to know for the project is the knit stitch. 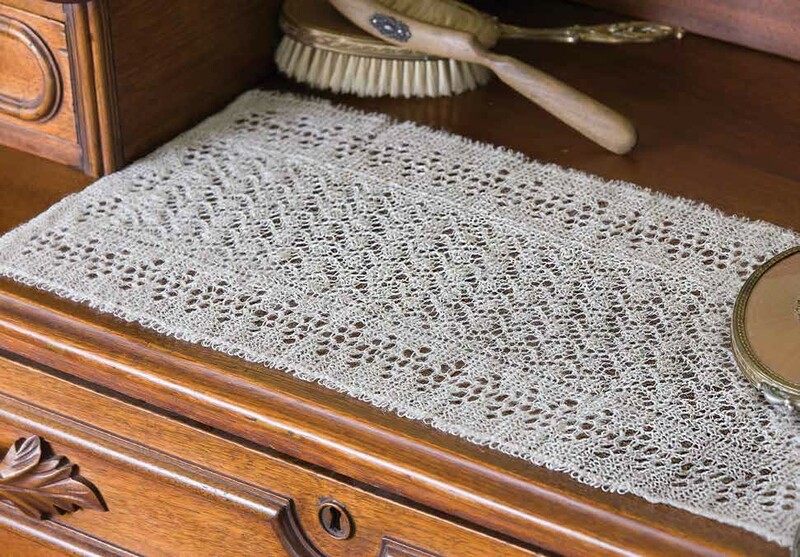 A knitted table runner adds a decorative touch when you’re entertaining guests. Get the pattern from Knitting Daily Shop. 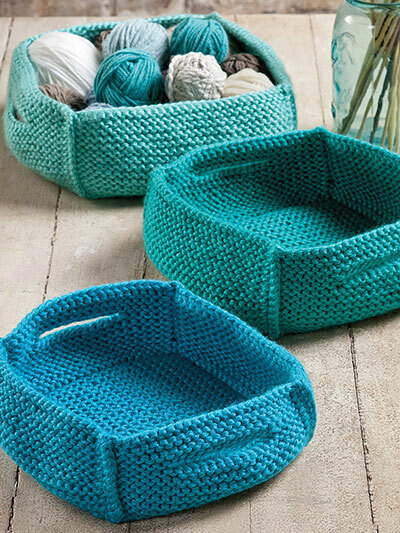 These knitted nesting baskets help corral everything from extra children’s toys and board games in your living room to a collection of lotions and perfumes on your vanity. Purchase the pattern from Annie’s Catalog. 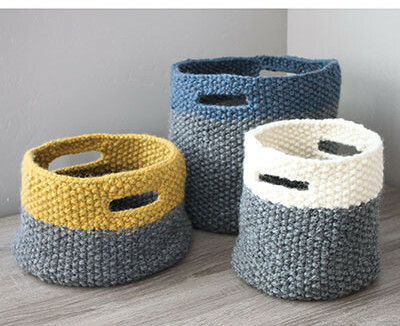 With a pattern that includes directions for both small and medium sizes, these chunky garter stitch baskets are sure to add a bit of homespun charm to your decor. Knit Rowan has the details. Use square baskets to turn an empty shelf into a customized organization station. Craft Drawer has the details. 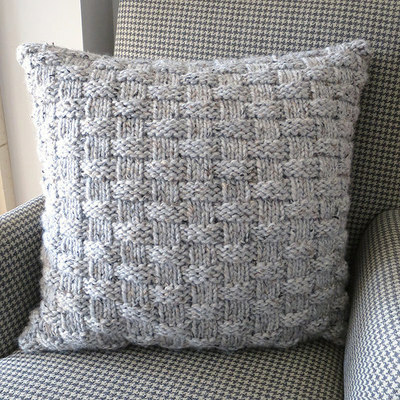 Cables and cross stitches create a cushion with a rich and inviting texture. Get the pattern at Let’s Knit. 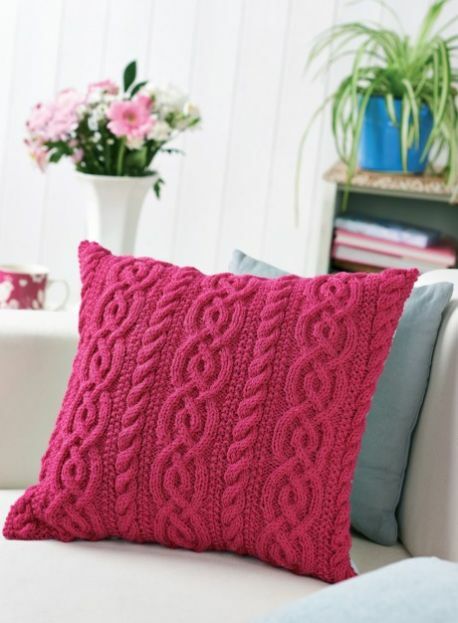 This basket weave pillow pattern from All Free Knitting is made with a basic combination of knits and purls. This means it would be a good beginner level project for someone working on mastering the fundamentals of knitting. What should you do with all those knitted swatches? Instead of simply tossing them or shoving them in a box, why not display them to make pretty wall art for your home? This quick and easy project is a fabulous way to decorate your home with the things you love the most. Photo courtesy of Grace Akhrem. 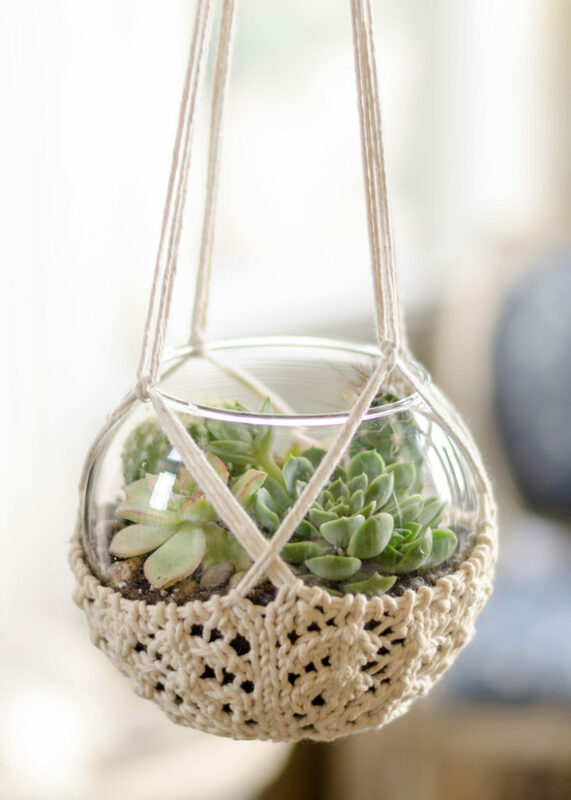 Display a pretty terrarium in this knitted hanger to create an eye-catching display in your home. This is a modern update to the macrame plant hangers that were so popular in the 1970s. Pam Powers Knits has the pattern. 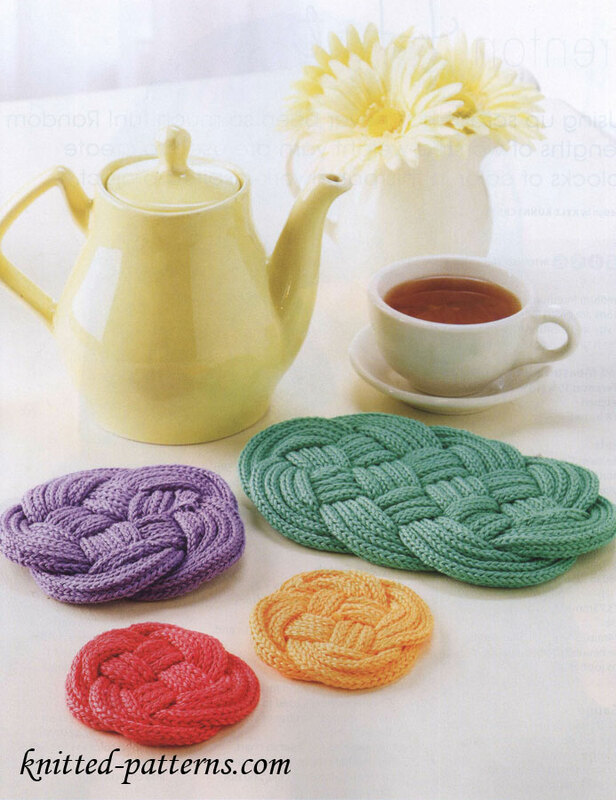 Use up leftover bits of yarn by making coasters and trivets that add a pop of color throughout your home. Learn more at KnittedPatterns.com. 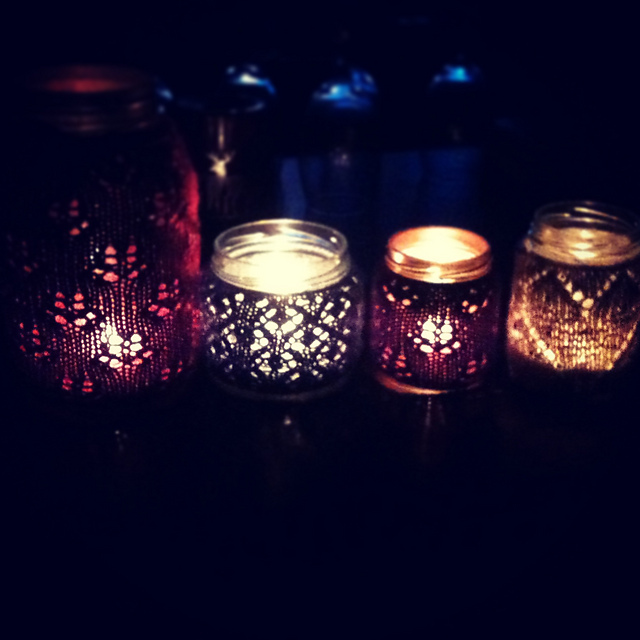 Wrap mason jars in knitted cosies, then drop a tea light inside for a bit of stylish mood lighting. Ravelry has the details. 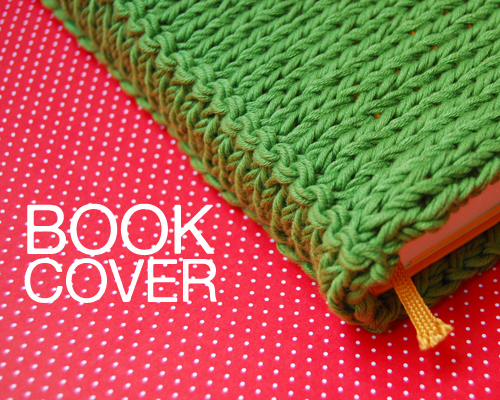 Turn your favorite books into works of art with colorful knitted book covers. The pattern for this DIY project is available at We Are Knitters.